Ocean Andrew and Hunter Anderson launched On The Hook Fish and Chips food trucks in 2016 and are expanding across the region. From food to fashion, research to tech, UW students have great ideas to power the future. What started as an idea between two friends has quickly grown into a multistate operation, with plans to expand throughout the country. 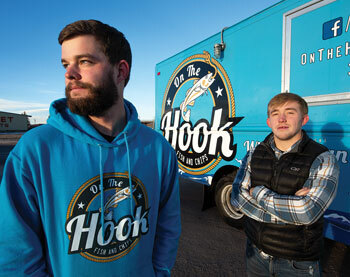 On The Hook Fish and Chips food trucks were the brainchild of University of Wyoming classmates Ocean Andrew and Hunter Anderson. They hope one day to have trucks serving all 50 states. 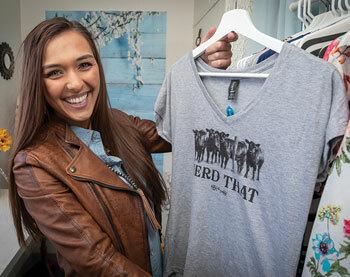 UW’s student entrepreneurs are as diverse as the students themselves. Here, you’ll read about businesses that feature ionic liquids, blockchain, fashion, safety helmets and research equipment—a small sampling of the many startup ideas current students and recent graduates are pursuing. Anderson and Andrew started talking about the food truck idea during a class they had together. Originally from Wenatchee, Wash., Andrew graduated in spring 2017 with his degree in energy resource management and development. His father is a commercial fisherman in Dutch Harbor, Alaska, and owns part of a commercial fishing company. “He catches wild Alaskan cod, so my family has always had access to a lot of cod,” Andrew says. Anderson grew up in Cheyenne and is taking time off from school to focus on the business. They took out a loan to have a truck built and served their first fish and chips in Laramie May 31, 2016. From Laramie, they expanded to Cheyenne. A year later, they added a second truck and began serving more cities in Wyoming, as well as Colorado. They also added several employees. “The second year is really when our format developed for a traveling food truck,” Andrew says. In spring 2018, they had two more trucks built that were geared for traveling, and they expanded to Nebraska and Utah, maintaining a staff of 18–20 people throughout the summer and contractors such as an accountant. Next, they’ll add three more trucks and expand to Montana, Idaho and South Dakota. They are also adding bases in each state and building a large headquarters in Laramie that will include parking bays, a dry warehouse, food production and storage, and offices. Their homemade sauces and batter will be made and packaged at the new headquarters. 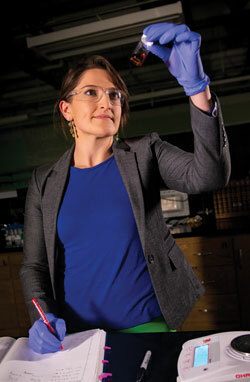 After a postdoctoral year at UW, Kristin Di Bona launched Wyonics, specializing in ionic liquids. Kristin Di Bona of Tuscaloosa, Ala. came to UW for postdoctoral research in molecular biology while her husband, Caleb Hill, accepted a position in the Department of Chemistry as an assistant professor. Following a year of postdoctoral research, she founded the tech company Wyonics. Wyonics received a $150,000 Department of Energy grant to generate resources out of coal and coal byproducts. As part of this grant, Wyonics has designed ionic liquid processes in order to extract rare earth elements directly from coal and ash. The grant was made possible through the Small Business Innovation Research (SBIR) program. “One goal is to make coal products too valuable to burn,” Di Bona says. Wyonics is also looking at other applications. For example, once biomass is dissolved, it generates biopolymers that can be used for biomedical technologies. Wyonics has partnered with a company in Alabama to generate high-grade chitin-based medical products from shrimp shell waste. “A few applications include functionalized bandages as well as inexpensive intrauterine devices,” Di Bona says. Wyonics hopes to scale up and further demonstrate its technologies. “Right now, we’re looking for partnerships with UW and other businesses to try to bring this mainstream and be an important part of the state’s economy,” Di Bona says. She has found Wyoming a welcoming place for entrepreneurs, and Wyonics hopes to expand opportunities in the state. Blockchain is a relatively new form of digital ledger technology, and the digital currency Bitcoin was one of the first applications of blockchain. Thanks to the work of the Wyoming Blockchain Coalition and state leadership, Gov. Matt Mead signed legislation this past spring that allows Wyoming to be the first U.S. state—and one of the only places in the world—to create a legally distinct asset class for blockchain that positions the state to be a leader in the blockchain sector. Ian Smith of Jackson Hole, who graduates this May with his law degree, seized the opportunity, opening Jackson Hole Blockchain. Smith invested in Bitcoin and Etherium cryptocurrency early on, but it was the blockchain technology itself that he found extremely interesting. The first step was for him to become a registered agent for interested companies. “The idea behind that is that getting a network of people who I’m the registered agent for will help me in the second stage of the company, which will be offering tax and legal counsel to these companies as they deal with the issues that will come up between state and federal laws,” Smith says. Eventually, Smith hopes to help companies that want to operate from Wyoming create server banks. The state’s affordable energy will be one draw, he believes. “The favorable tax laws and favorable corporation laws in Wyoming make Wyoming a really great candidate for companies to come and set up shop,” Smith says. He already has clients and plans to launch a full website and marketing materials upon graduation. “It’s diversifying Wyoming away from the traditional boom and bust oil and gas stuff, which I think is really important for the state’s longevity,” Smith says. Recent graduate Yahsmin Gorji operates Countree Cutie online boutique as well as this space in Mattimore Harness. Because Gorji was finishing school and also considering graduate school, Countree Cutie mainly sells online, including a line of custom graphic Ts, wild rags (western scarfs) and hats, as well as shirts, cover-ups and jewelry selected from wholesalers. The boutique also has a nook at Mattimore Harness. Her entrepreneurial roots go all the way back to when she was 12 and sold handmade purses and diaper bags on Etsy. This fall, she took an agribusiness entrepreneurship class with Associate Professor Mariah Ehmke—a course she found especially helpful in expanding her business plan and executive summary. She also received help from the Wyoming Women’s Business Center in the form of a business adviser. Gorji says her online boutique will follow her wherever her career or coursework takes her, but one day she dreams of opening a full storefront boutique. Student Jason Young helps conduct research on novel liquid-crystal materials used for helmet padding in the Advanced Materials Laboratory as part of the university spinout company, Impressio. Undergraduate mechanical engineering senior Jason Young is part of a team that could make football and other helmets safer and more effective. 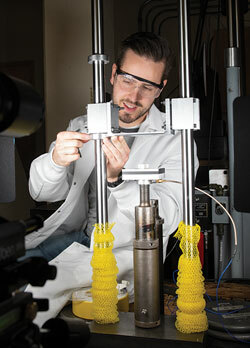 Young works part time as a research assistant in the Advanced Materials Laboratory managed by Carl Frick, mechanical engineering department head, who is among the founders of Impressio, a startup company that aims to redefine energy dissipation in helmets to help prevent concussions and chronic traumatic encephalopathy. Frick has spent the last four years researching novel liquid-crystal materials that could be used as helmet padding to absorb the force created during game action. If the unique material proves superior, which he believes it will, it could be used for helmets across many sports and in the military. Winner of the 2018 John P. Ellbogen $50K Entrepreneurship Competition, Kennan Oyen works on prototypes for her business, IoTherm. This past spring, Kennan Oyen and her business, IoTherm, received the grand prize in the business track category of the John P. Ellbogen $50K Entrepreneurship Competition, taking home $25,000. Originally from Fairbanks, Alaska, Oyen created IoTherm with her husband, Joey. IoTherm creates precision temperature-control systems that are small customizable units designed to perfectly accommodate standard laboratory glass vials. Oyen earned her Ph.D. in ecology in May, and the business idea for IoTherm was born out of her dissertation research, which focused on the hottest and coldest temperatures bumblebees can withstand. Along with her adviser, Michael Dillon, a UW zoology and physiology associate professor, Oyen wanted to know the limits on predicting how climate variability might influence different bumblebee populations. “There weren’t commercial heating and cooling options available that fit our research needs, so we decided to try to build something better,” Oyen says. The benchtop cooler they developed has all the capabilities needed to run experiments requiring precision temperature control in remote field sites, making it one of the only systems of its kind. They realized that the systems have potential for several different applications, and Oyen hopes to expand the product in new directions. In conjunction with the launch of the Institute of Innovation and Entrepreneurship (IIE), an assortment of diverse and exciting curricular options are being explored for all University of Wyoming students. Options under consideration include a cross-campus entrepreneurship minor open to all UW students, as well as potential undergraduate and graduate entrepreneurship degree programs within the College of Business. These programs will focus on both in-class and out-of-class activities to provide a variety of meaningful experiences for students. In the College of Law, an entrepreneurship and intellectual property practicum is being developed for launch in the fall of 2019. The practicum would provide hands-on learning for law students interested in areas of intellectual property and business creation. In addition, as part of the IIE, a culture of entrepreneurship will be promoted across campus. Students will engage in experiential learning through integrated coursework, competitions, class projects, internships and more, leveraging opportunities with startup companies, existing businesses, corporate partners, and campus and state entities. Hosted by the University of Wyoming College of Business, the annual $50K John P. Ellbogen Entrepreneurship Competition is designed to encourage Wyoming students to act on their talents, ideas and energy to produce tomorrow’s leading businesses. Graduates and undergraduates from all colleges are invited to participate. Competitors have the opportunity to meet and network with successful entrepreneurs who serve as mentors and judges for the competition. Since 2000, the competition has hosted more than 200 diverse student entrepreneur teams and awarded more than $400,000 in cash prizes, in addition to providing continued mentorship and logistical support.